Hitting submit on my final order was a bit nerve wracking. Once I do this it's final. It's too late to decide that there should have been a comma there or a certain word should have been capitalized. Unlike my blog once I hit submit I can no longer go back and edit. That being said I am also glad to have it done because it IS so final. No more obsessing over the wording and whether or not everything is perfect. After extensive research I decided on Invitations By Dawn. I immediately liked "In The Pink" online and knew it was perfect when I received the free sample. I could have gotten some cheaper ones but they would have looked that way too. It is a fold over design printed in raised black script on pink heavy card stock paper. 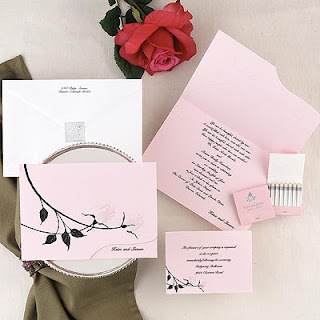 There is a pretty black and a pink pearlized flower embossed on the front and our first names are visible from the front through a little cut away. They match our wedding colors, they look elegant and are of good quality. They come with outer AND inner envelopes. The cost is $121.80 for 100 invitations and $65.80 for 100 Response cards. We also got invitation tissue for $2.00 making the grand total $189.60. I was able to customize everything online. I was able to view a mock up of the invitation but not the RSVP. I did not order proofs. They were $15 each. I liked the invite sample and I proof read the invite so I think it will be OK that I didn't. I also got to working on our wedding website because we are going to print the website URL on mailing labels and stick them to the outside of the inner envelope. This is the online digital age. There is a website for everything so why should my wedding be any different? We are using mywedding.com. Guests can RSVP and choose their meal here. They can view our wedding registry, city information, wedding and hotel information, view pictures of us , sign our online guest book, contact us, and find out a little bit about how we met. It's totally free. I LOVE the way it turned out and it was really fun doing it too. I will plan on sending them out early March and request RSVP by June 1st.